When Richard Mille watches first appeared on the scene- it was one of those horological wonders that I would never be afford and even if I could, never justify to the wife. I’m not comparing the Seven Friday watch to RM, far from it. 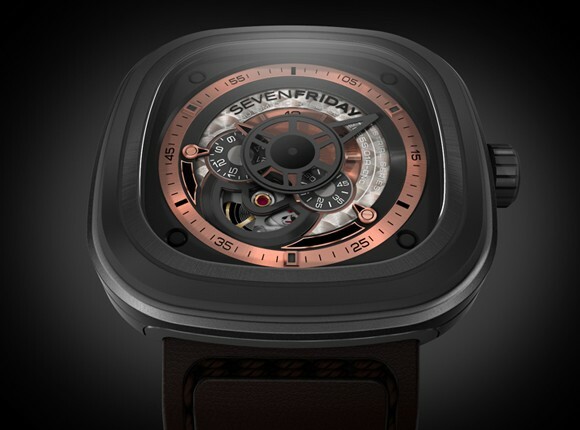 It’s just that in terms of modern, cool and mechanical timepieces, Seven Friday is something I can afford without breaking the bank. The coolest sub $1000 modern mechanical ever. The modified Japanese Miyota 82S7automatic movement instead of Swiss ETA is probably what keeps the price tag under the $1000 threshold. In terms of aesthetics, square and round edged, the Seven Friday watch is reminiscent of another timepiece- the TAG Silverstone. I will not discuss the movement in detail other than it’s not a complication and only looks like one thanks to open heart on dial exposing the balance wheel. Think of it as a poor man’s Hautlence or Urwerk. The dial set up is quite straight forward- hour and minute hands, a seconds and 24hr disc- Seven Friday is available in 3 versions: silver rhodium, dark grey pvd contrasted with rose gold and finally, black pvd with red accents- dubbed P1, P2 and P3 respectively. Interface: Silver / rhodium and black; finished alternatively circular, brushed, mat, diamond cut with 11 applied parts. P02 in Stainless Steel case with medium grey PVD treatment. Here the “animation ring” is Eloxed aluminum warm grey with sandblasted finishing while the interface: 5N / dark grey and warm grey; finishing alternatively “opalin”, mat, diamond cut, satine, “bouchonné” with 11 applied parts. Personally, my favourite Seven Friday timepiece. The “stealth” P03 in Black, gun metal & a touch of red; finishing alternatively “opalin”, mat, diamond cut, satine with 11 applied parts. The Seven Friday P3 is the only one with the contrast red accent on the underside of the watch band. 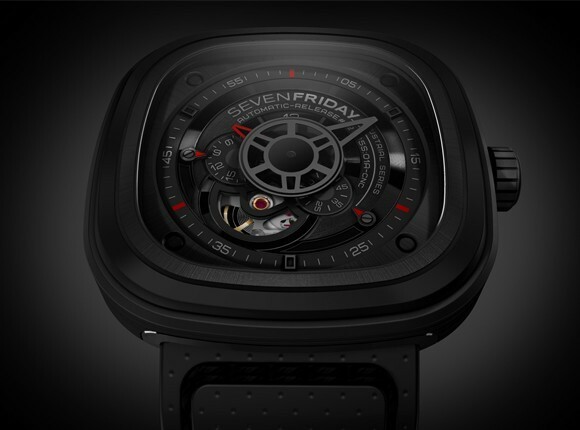 In case you haven’t noticed, all iterations of Seven Friday come with a specially hardened and antireflective treated mineral glass. 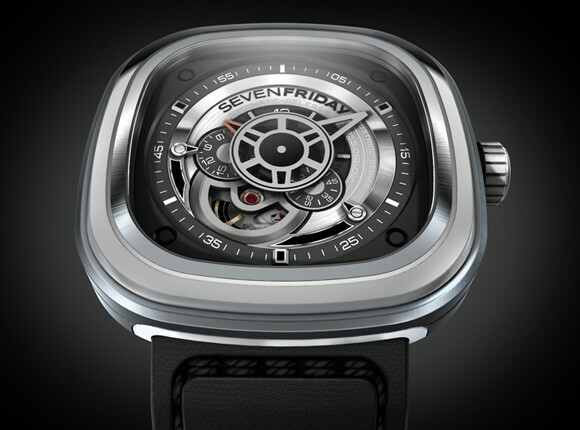 The Seven Friday P02 is customized with specific discs for 24H and small second functions while a special minute hand is designed as an extended arm of the mechanical movement. Seven Friday P01- Animation ring: eloxed aluminum pantone 428C, vertical brushed finishing Interface: Silver / rhodium and black; finished alternatively circular, brushed, mat, diamond cut with 11 applied parts.